I couldn’t put this book down…I read it in two days in between my working hours! If you get a chance…pick up a copy and see for yourself. I would LOVE to hear what your thoughts are on it. If you missed the awesome Funnel Tunnel, you can see it here. I love the tones here. Beautifully done. So true…in looking at the steps, some might see a mess. I see ice cream, strawberry kool-aid spilling, black licorice, and a leaf as well as many other things. Your message is so inspiring. Some time ago, I bought canvas and paints and was going to try my hand at painting (I always say I can’t draw even stick people; and I probably can’t), but have left them in the closet. Your post gives me bravery to try something…even if it looks like a mess to others. Oh Peabea…you just inspired me♥ Happy creating. http://thesketchypoet.wordpress.com Thanks for your timely and encouraging post. This book is going on my wish list. I enjoy Seth Godin’s blog — always thought-provoking and creative (yes — he certainly can teach us about creativity). These steps look so fun and colorful! How beautiful. The colours are so soft and inviting. We have a family art show every 3 months. Yet recent its been a bit longer. Now these are really cool, Laurie!! great book – and post! 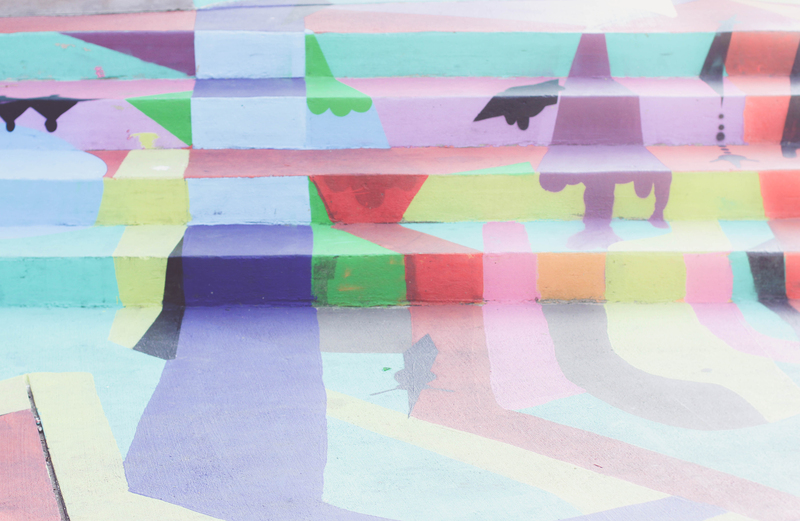 Such colorful steps, Laurie. Gotta check out that book too. Love the shot you chose, Laurie. Have a beautiful Tuesday, my friend! I love this colourful artful image, Laurie. I had heard of the book but not got around to putting it on my book list yet. Thanks so much for the excerpt and recommendation! Much appreciated. Fabulous design on those steps, Laurie, and so well captured by you. The book sounds so exciting. I’ve just ordered it for my kindle. 🙂 Thanks for bringing it to my attention. Your excerpt has me wanting to read more. Thank you for sharing both the profound words and the cool shot of the steps. I loved the Funnel Tunnel! You have never been afraid of your art…what others might think? Sounds like a great book Laurie, I love the steps in the photo, they look really interesting. Thank you Leanne…nice coming from you. Have a great day. THANK YOU!!!! I NEEDED THAT!!!!!!!!!!!! xoxo I so have to come back to read again and again. Oh, I love this! And art is definitely a journey and one that means different things to different people. The Funnel Tunnel is so beautiful! Your posts have said so much about art, but very pretty. Thank you, Laurie! What a beautiful comment you left…I do hope others will read this book. Beautiful lines and colors to photograph! Laurie, fabulous post–hope that your quote and commentary along with the image inspire others. Great job. I’ll have to check it out. Thanks Laurie. I liked the “Funnel Tunnel”, but I think I like the steps even more.